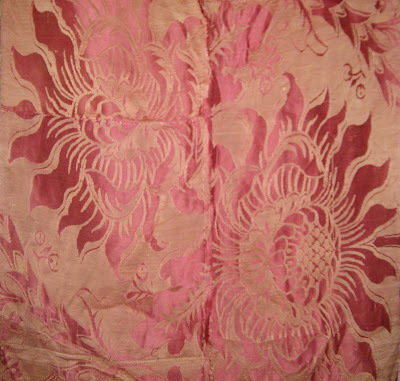 Here are some beautiful pieces of early velvet and silk. 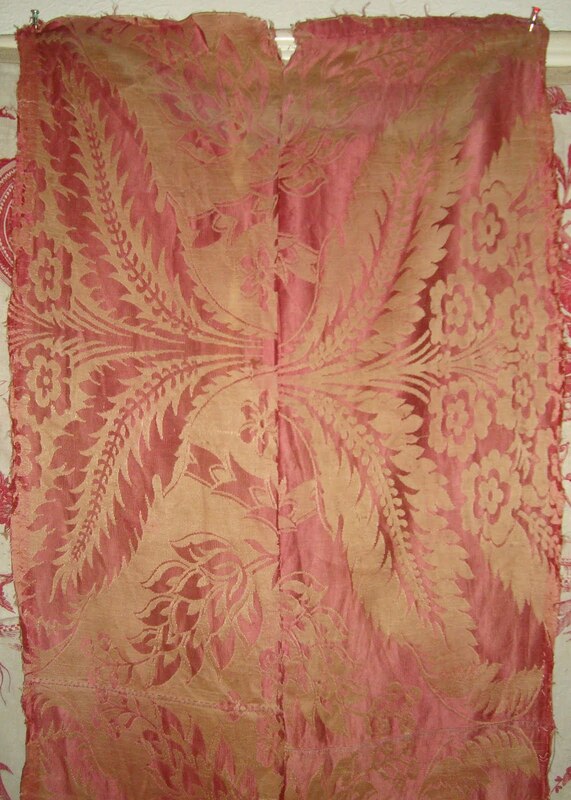 I think the pink silk is 18th century, French, some small fragments of a large scale damask pieced together, mismatched, some even back to front, but still a wonderful reference piece. The deep blue/green velvet piece is made up as a runner with passementerie trim and a silk lining, again, pieced from fragments. I believe it to be Italian, late 17th century or early 18th century, but cannot find any solid references, but it is very similar to the red & gold piece, which I could reference: I think it is Italian and dates to the second half of the 17th century. Velvet was extensively used as a furnishing fabric because of it's comfortable, hard-wearing pile. The pile was often one colour, generally red as it is in this example, on a matching or contrasting background. It is known as Ciselé velvet, the pattern, incomplete here, shows large styalized florals and leaves in pinkish red pile, cut and uncut, on a yellow satin ground. The selvages have narrow stripes of green and cream silk.